People like to describe gigs in tiny venues as intimate, but this packed out show at Brighton Dome was less formal and more frank than almost any pub gig we’ve been to. It turns out Amanda Palmer has had a bad few years – not that it’s dinted her sense of humour. We hear about her abortion, her miscarriage and the death of loved ones, both in confessional stories told from the piano stool and in blackly comical ballads. Somehow, despite the wild shifts in tone, it all hangs together. Comedian Andrew O’Neill opens the night with a musical stand-up set aimed squarely at the geeks and goths. Suffice to say, it finds its mark. He returns throughout the night to help out the headliner with some of the more goofy sections of the show including a diva vocal performance on a song about Vegemite. He’s a canny comic, a good foil to Palmer’s occasional histrionics and a reminder of what a support act is supposed to be. Palmer plays two sets, punctuated by anecdotes and asides, the first of which includes some old favourites from her days in The Dresden Dolls. She announces tonight, for the first time, that the duo are reforming this Halloween for a rare run of shows. For now, ‘Coin-Operated Boy’ and ‘Missed Me’ suffice as welcome reminders of her band’s superb debut. Things get more intense after an interval in which the singer takes to the aisles with her ukulele for a pre-planned impromptu cover of Radiohead’s ‘Creep’. Palmer has endured a certain amount of public scorn over the years, sometimes as a result of her tendency to overshare. However, whatever your stance on online etiquette this is hardly a trait to be deplored in a songwriter. She tells us about the trials of having a child and launches into ‘A Mother’s Confession’ which starts as if it means to go on as an indulgent parental love song, but actually undercuts all that with a gleefully deadpan chorus refrain. Even if she’s not the perfect mother, “at least the baby didn’t die”. 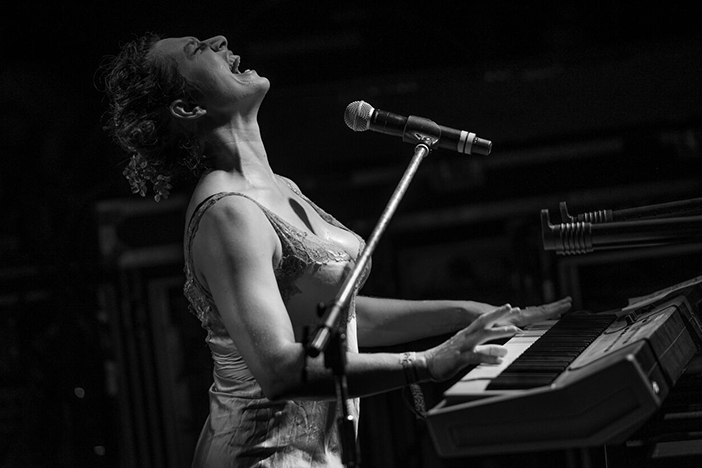 Other aspects of Amanda Palmer’s online world percolate into the live show, with frequent shoutouts to her Patreon supporters – the platform that enables musicians and others to draw a salary from their fans’ subscription fees. When Amanda Palmer uses the words “my people” she doesn’t mean her agent or her manager, she means her fans. Even if there’s a hint of internet tribalism in the phrase, that sentiment hasn’t diminished her capacity to sculpt songs around universal themes. ‘The Ride’, we learn, was written in response to a thousand messages from supporters which she elicited by asking them to tell her their fears. The result is a fraught but ultimately uplifting song about getting a sense of perspective, which borrows its main conceit from the Bill Hicks philosophy of life. Sat side-on at her imposing grand piano, Palmer’s playing is strident and lavish. Yet, as always, it’s the lyrics that really set the mood. Even when there’s no joke in the offing, her wit ensures there’s an undertow of irony in the darkest of songs. It’s this which does so much to inject a sliver of hope or deviance into what might otherwise come across as simply maudlin. It’s almost certainly an acquired taste, but for those who relish this kind of songwriting it’s a feast. There’s no album to push tonight, there’s no trace of tour fatigue and the set seems to work perfectly for both veteran and newly curious listeners. It makes us realise just how many bands end up following a format of unspoken and unchallenged conventions. Why can’t comedy and melancholic tinkling sit side by side on the same set? Why shouldn’t a performer engage with the audience on a direct and personal level? What’s wrong with a little intimacy?